Author Hester Young’s debut novel The Gates of Evangeline is landing on multiple must-read lists for the fall season, and garnering plenty of love from readers. Young graciously took time away from promoting her book to talk about how she fell in love with writing at a young age, her path to becoming a published author, and how her grandmother helped inspire The Gates of Evangeline. DF: Since you’re a Boston native, we have to ask: What’s your favorite place to eat in the city? Hester Young: I grew up in Cambridge, and for sentimental reasons, my favorite place is probably the S&S Deli and Restaurant in Inman Square. It’s been there for nearly a hundred years now, and I became a lifelong fan when they surprised me with a giant piece of birthday cake the year I turned seven. DF: When did you decide you wanted to be a writer? HY: I was 6 years old when I knew I wanted to be a writer. Six! I look at my son now, who’s 5 year old, and this seems ridiculous. But as soon as I knew that writing was an actual profession, that’s what I wanted to do. HY: Writing is often just a long and intense battle with myself to stay focused. I avoid music, writing outdoors, or anything that serves as a distraction from the task at hand. If I’m working from home, I’m always hungry, no matter how much or how recently I’ve eaten. That is just my body trying to avoid writing. I can’t let it win. I find that the library is usually best, because it’s quiet, they don’t allow food, and my local branch has incredibly spotty Internet. I do outline, partly because that allows me to jump forward in the plot should I get stuck. When I find myself really shunning one section, I move to another, and that helps me stay productive. DF: What inspired your debut novel, The Gates of Evangeline? HY: The book was inspired by my grandmother, Margaret. As a young mother, she had a recurring nightmare about her 4-year-old son, Bobby, falling from a window. One day, while in someone else’s care, he did indeed fall and died from his injuries. After Bobby’s death, my grandmother woke to find him in her bedroom one night. He reassured her that he was okay and left her with a feeling of great comfort. My grandmother was a skeptical woman who didn’t believe in what she couldn’t see and touch. The fact that she’d had this terrible premonitory dream and claimed to have seen a ghost—although she never used that word—really struck me. And so I began to imagine Charlie, a grieving mother who finds her own skepticism challenged by her strange, premonitory dreams. When the Louisiana setting turned up in my own dreams, I knew I had a novel. DF: What were some of the themes you wanted to tackle in the novel? HY: I was interested in exploring ideas of faith and skepticism without taking a particular stance. And I wanted the novel to be about how we construct meaning in our lives when faced with a tremendous loss. What I love about the end result is that I think it’s respectful of and open to different viewpoints. I’ve had everyone from atheists to fundamentalist Christians tell me the book resonated with them. DF: How much of yourself—and the people you have daily interactions with—did you put into your main characters in The Gates of Evangeline? How do you develop your characters in general? HY: I love almost all my characters and feel a great deal of empathy for them, but the only character in my book who strongly resembles a real person in my life is Charlie’s grandmother. She is very much modeled after my own grandmother, who passed away shortly after I started writing the novel. I love that my grandmother can live on in the pages of my book—she would really have enjoyed her fictional self. DF: How long did it take you to write the novel, land an agent, and publish it? HY: All told, it took about seven years. I wrote a few chapters of the novel in the summer of 2008, but didn’t really do much with it until I became a stay-at-home mom in February 2011. Once at home, I began to write quite regularly and finished the book in February of 2013. The novel sat around for months while I revised and over-revised until finally my husband gave me a deadline. After that, it all happened very quickly (for the publishing world, at least). I sent an email query to just one agent, whose agency I had interned with 15 years earlier. Within 15 minutes, he’d asked for the full manuscript, and I’d signed with him by the end of the month. I spent a few months making revisions under his guidance, and then, in March 2014, he sent my manuscript out. I’d signed a three-book deal with Putnam by the end of April, and my book hit stores on Sept. 1, 2015. 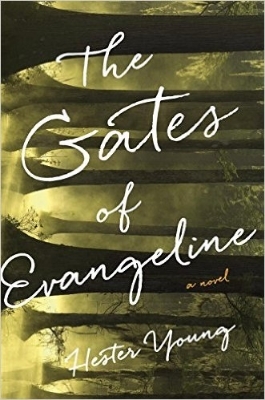 DF: The Gates of Evangeline has landed on quite a few fall reading lists from a variety of publications. What has that experience been like and what’s next for you? HY: As a writer, it is amazing when anyone notices your work at all. This book has gotten more attention than I ever imagined, and from such a diverse group of sources—from People Magazine and the U.K.’s Daily Mail to Library Reads and IndieBound. My head is still spinning. Honestly, though, it’s a lot of pressure, too! The Gates of Evangeline was purchased as the first in a trilogy, so I have two more books that need to measure up. I am just finishing up with the second, and should be moving on to the third book in a few months. HY: I’ve said this elsewhere, but I think it’s an important paradox to wrap your brain around: as a writer, you need both the humility to accept criticism and the dumb confidence to withstand rejection. Learn to be grateful for thoughtful criticism, not afraid of it, because that will shape your work more than any compliment. Also, people tend to romanticize publication, to see it as a sign that your work is at last “good enough.” In an age of Amazon and Goodreads and book blogs, however, publishing means you are opening yourself up to more rejection than ever before. At the end of the day, the writing has to be for you. HY: I’ve gone both hot-air ballooning and scuba diving, which means I’ve been both higher and lower than many people ever get to go. I’m sure there’s a writing metaphor in that somewhere, but I’ll let you find it. To learn more about Hester Young, visit her official website, like her Facebook page, or follow her on Twitter @HesterAuthor.